The Cardinals carried their colors to new heights of achievement and left their mark on fans and opponents alike, especially in post-season play. Seven UIW teams earned post-season honors: men's and women's soccer, men's and women's tennis, and baseball, softball and synchronized swimming. And four squads captured conference championships: women's soccer, women's tennis and baseball, and men's soccer in the Southwest Soccer Conference. University of the Incarnate Word athletes earned seven All-American slots, three all-region, and nearly 40 were selected for all-conference honors. Exceptional performance in the classroom earned recognition for seven students with cumulative grade-point averages of 3.5 or higher. This year's Academic All-American achievers were Yaniv Braver of men's soccer; and Danielle Kramer, Lyssa Wallace, Emily VanVleck, Rachel Simons, Christine Grisham, and Zoe Villarreal of synchronized swimming. 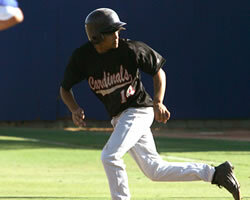 Freshman outfielder Chris Pacheco rounds the bases. The final game was the NCAA Division II South Central Regional Tournament in Abilene. The Cardinals had won the regular season championship for the Heartland Conference and earned an automatic bid to the regional event. In years past, the Heartland champion had to be invited as an “at-large” team, but this time it was automatic, taking the Cardinals all the way to the division championship game. They eliminated major teams and led for seven innings over Montevallo of Alabama before losing 9-8. 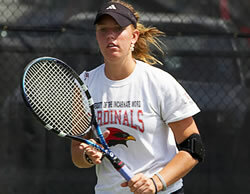 Montevallo had been on top throughout the tournament until it met up with the Cardinals. As a result, four Cardinals were named to the all-tournament squad. When the season ended, the Cardinals were ranked nationally in two polls - 19th in the National Collegiate Baseball Writers Association and 23rd in the American Baseball Coaches Association. Cardinals softball set a school record with 46 victories, bringing them an “at-large” bid to the South Central Regional Tournament. Ranked eighth and last, UIW had an impressive win over the number-one ranked team and reached the title game. Like their baseball counterparts, the Cardinals had the eventual winner, Central Oklahoma, on the ropes until the last inning. The university ended in the runner-up position, a noteworthy accomplishment as it was the team's first post-season performance and helped place four players on the all-tournament squad: Patty Madera, Allison Britt, Amanda Sparks and Cecilia Duron. The final National Fastpitch Coaches Association poll ranked UIW 14th among all Division II teams. Stephanie Boswell readies to place her next shot. Our swimmers presented the biggest splash this season for the second year straight and finished third at the U.S. Collegiate Championships. Five swimmers were named All-American: Danielle Kramer, Lyssa Wallace, Emily VanVleck, Natalie Chase and Rachel Simons. Six were Academic All-Americans. The only teams to defeat the Cardinals were from Stanford University (of the “Pacific 10”) and Ohio State University (of the “Big 10”). Cardinals tennis made it to the regional competitions this year and, although they didn't prevail, they had a solid season of play that got them there. 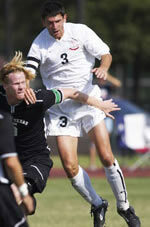 Men's soccer star Kevin Langan was awarded UIW Student-Athlete of the Year. An all-region performer on the soccer pitch, Langan found the time and energy to achieve a 3.88 grade-point average and earn a master’s degree in sports management while contributing all-out to his team. Congratulations from the UIW family! -- Wayne Witt, sports information director. ©2006 University of the Incarnate Word. All rights reserved. Send feedback on this page to Troy Knickerbocker.